If you like tech stocks with respectable and growing dividends, keep an eye on these three. It's often the case that investors in tech stocks are hungry for growth and, ultimately, substantial share price appreciation rather than dividends. After all, if you're on the hunt for stocks that can, say, double your money over a relatively short amount of time, whether those stocks pay dividends (or, if they do, the size of that dividend) isn't necessarily going to be top of mind. However, if you're a tech investor who's interested in large, market-leading tech giants that also happen to pay respectable (and growing) dividends, here are three stocks that you might want to put on your radar: Apple (NASDAQ:AAPL), Microsoft (NASDAQ:MSFT), and Texas Instruments (NASDAQ:TXN). 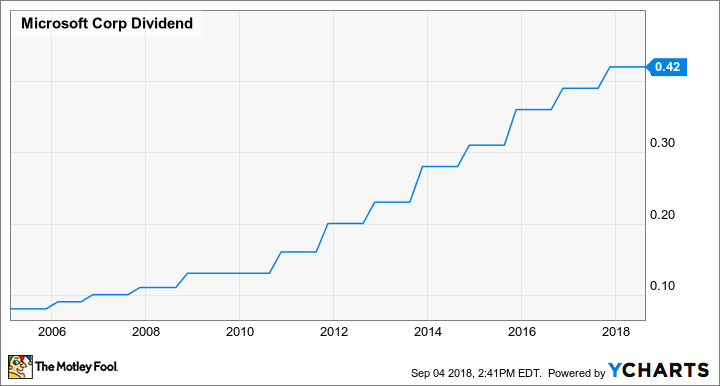 Apple hasn't been paying a dividend for very long, but ever since it re-initiated its dividend in 2012, it has done a good job delivering steady increases in the size of that dividend year after year. AAPL Dividend data by YCharts. Apple's dividend is supported by a business that generates robust earnings per share. 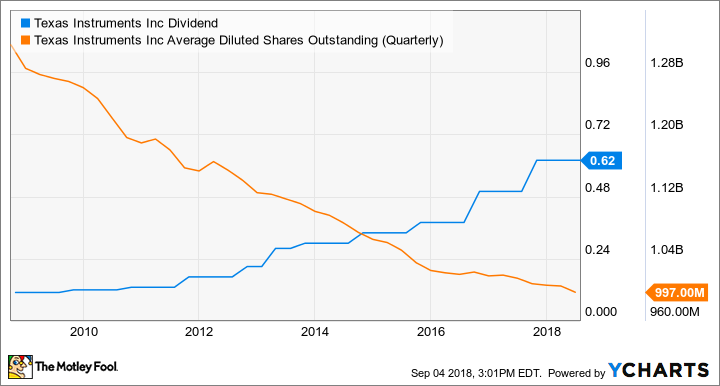 For some perspective, Apple's current quarterly dividend payment of $0.73 per share works out to $2.92 per share on an annualized basis (that's a dividend yield of just under 1.28% as of writing). 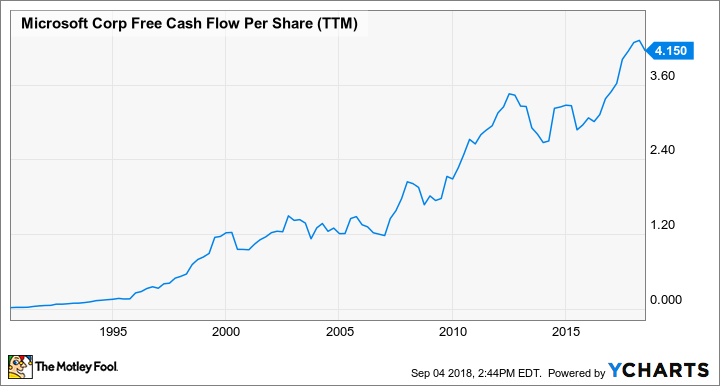 Over the last 12 months, Apple's business generated $11.52 per share in free cash flow -- enough to cover the dividend nearly four times over. AAPL Free Cash Flow Per Share (TTM) data by YCharts. On top of that, while there have been bumps along the way, the trend in Apple's earnings per share -- thanks to a combination of both increases in net income and aggressive share repurchases -- has been up and to the right. Apple's dividend is respectable and, based on the company's financial performance, sustainable. Although Microsoft hasn't (yet?) 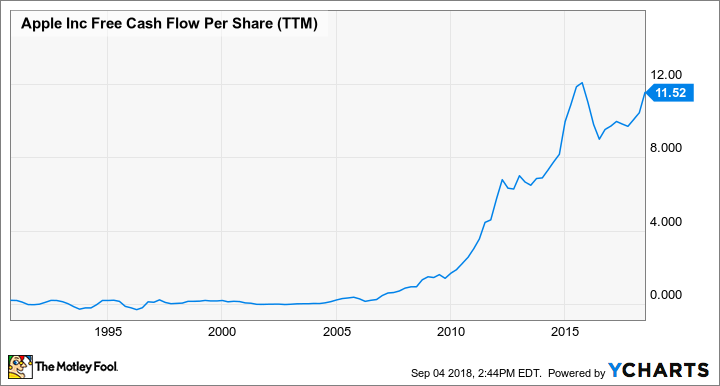 joined the trillion-dollar market cap club that Apple recently formed, it's a giant in its own right, valued at a market cap of nearly $860 billion as of this writing. MSFT Free Cash Flow Per Share (TTM) data by YCharts. Microsoft's dividend yield as of writing is 1.5%, slightly bigger than Apple's. Microsoft's growth comes from a diverse set of businesses and in early August I picked it as a growth stock set for long-term success. Chip giant Texas Instruments has a very generous capital return policy. Right on the front page of the company's investor relations website, the company says that it has "committed to return all of our free cash flow to shareholders through dividends and stock repurchases." It also talks about how it has delivered 14 years of uninterrupted dividend increases and has brought its share count down by a whopping 43% since 2004. On top of that, the company says that its free cash flow has enjoyed an 8% compounded annual growth rate since 2004. TXN Dividend data by YCharts. Texas Instruments is clearly (and, frankly, deservedly) proud of its capital allocation strategy. Texas Instruments isn't anywhere near as large as either Apple or Microsoft, sporting a market capitalization of about $109 billion as of writing, but it's a giant as far as chip companies goes. 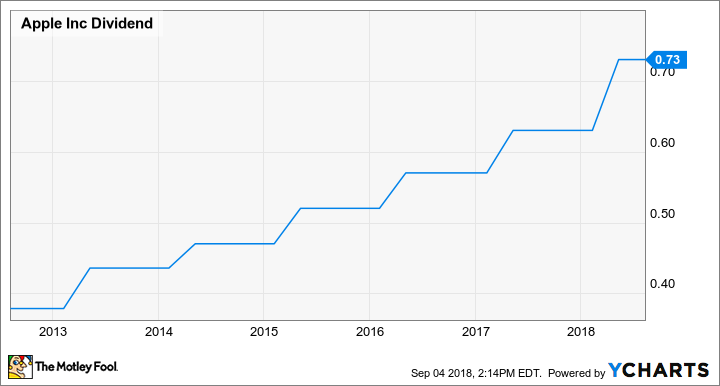 It's also a company with a solid capital return policy that pays out a solid dividend today (Texas Instruments' stock sports a 2.21% dividend yield) and offers investors a good opportunity to enjoy growing dividends in the coming years.